Our Saviour’s Danish Evangelical Lutheran Church was formed in 1894 by a group of Danish immigrants in Bridgeport led by Pastor A.W. Andersen (right), newly arrived from Denmark. The congregation constructed its first building in 1904 on Beech Street, moved to Washington Avenue in 1922, and in 1961, left Bridgeport to become a mission congregation in Fairfield, where, led by Pastor A. Everett Nielsen, services were held initially in the Riverfield School. In 1963, the Rev. 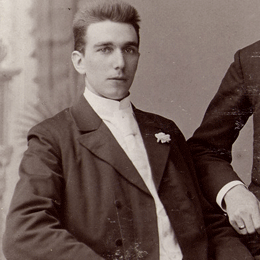 Dr. Albert P. Schilke became pastor. Land was soon purchased on the corner of Hill Farm and Duck Farm Roads, and on November 28, 1965, the current building was dedicated. Dr. Schilke was succeeded as pastor by the Rev. Richard E. Lindgren in 1971, followed by the Rev. William S. Carter in 1979, the Rev. Henry E. Morris in 1984, and the Rev. Mark E. Christoffersen in 2002. As the mission of Our Saviour’s has expanded, so has our church facilities. In 1976, the worship space was refurbished and Schilke Hall was added. In 1998, a new education wing was built, and in 2000, the upper parking lot was added. Today, we are sustained by the same faith and generosity as those who have gone before us. We look forward to the opportunities and challenges ahead, confident that the Lord, who has brought us safe thus far, will continue to lead us as we grow in mission. For a more detailed history of Our Saviour's, click here.